oomph. : reap what you sow. thanks for all the sweet comments yesterday. the link (ahem, kim. lol!). the red velvet was good, but my sister opened the bottle a few days prior. i may not have had it at its best, but many of you had positive things to say about it. i look forward to trying it again. "i don't have to look at you because mom doesn't!" kids are receptive to everything that's going on around them whether we like it or not. i expect the minis to become respectful, honest, and responsible adults, and i'm their prime example. so in keeping up with my resolutions, i have been sleeping earlier (no blogging till 1am)...so that i can wake up earlier...so that we can have pleasant mornings...so we can get to school on time. if i don't get to your blog on a daily basis, know that this is why, and i will catch up the next chance i get. as much as i enjoy my late nights and me time, i have to make sacrifices for the minis. after all, we reap what we sow. 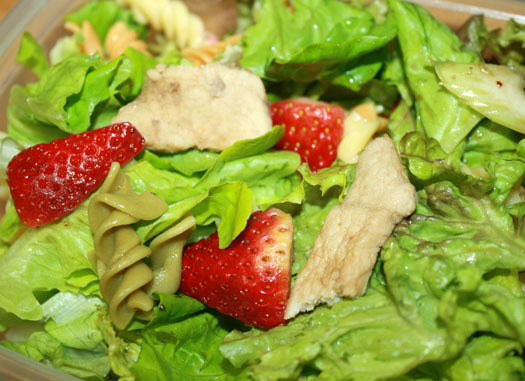 today's lunch...salad made with lettuce from our own garden. find these and more tweedy goodness at currently obsessed. Good resolution. I need to try that, but it's so hard. Love staying up late on the internet. What a cool outfit. Love the blazer. Love this look! Business and glamorous all rolled into one! I totally know what you mean! One thing I want to work on is spending more time with my kids...it seems like you're off to a great start though! those tweed shorts are so amazing. and i love the elbow pads on that classy blazer! I haven't stopped by in a little bit --something along the lines of trying to reap some different results in my life as well--but you look as lovely as ever! Congrats on reaping your own lettuce!! How nice! I love your entire look, but I would LOVE to have that blazer the most. I really want to find a light colored one other than white. Now gotta go check out the cupcake wine post---I know that stuff! i love the whole outfit!! especially your blazer and shoes!! This is a great work look! Do what you have to do to get to bed earlier, it makes such a difference to be more rested! It is so very true and it is amazing that how we as parents constantly need reminding of this. My kids floor me all the time with imitating me with things that I thought they weren't paying attention to. What a great resolution and I wish you the best. I know that you can do it! Love your blazer, beautiful! I also love everything about your resolution.Motherhood is really a lot of sacrifices for your own welfare but it's all worth it. :) I also agree in parenting that you reap what you plant.Setting to be a good example can thought them many ways but I think it's not also a guarantee that they will become a good person afterwards,it's still on their own free will where they will put themselves. However socially I know/hope/praying it will help kids to interact in a respectful manner. As a mom it's better to mold them in a good ways than not. 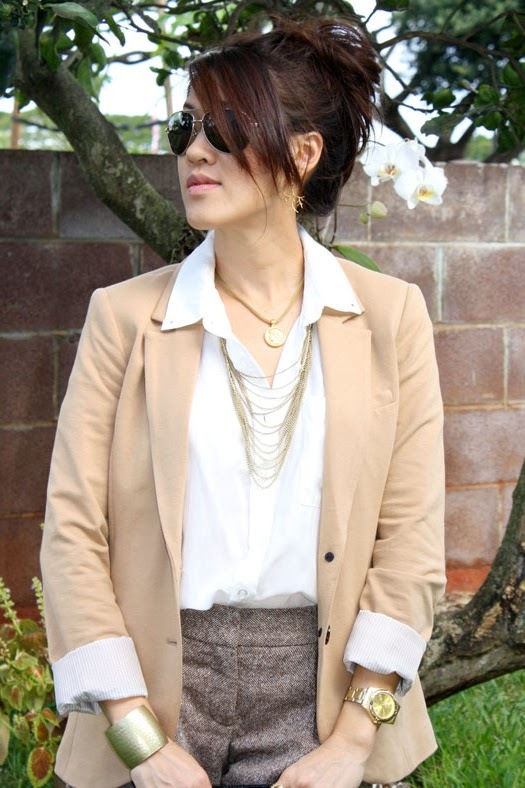 LOVE the neutral colors in this outfit! Puts me in the mood for spring. Oh and the gold jewelry additions were perfect! Oh and as for me, I'm still slightly afraid of my mom hehehe. Won't even think about walking away or sucking teeth or the like in her presence. She tells me I'm not too old to get smacked and I believe her :) She is however such a pushover when it comes to her grandkids (my siblings kids) so I venture a roll of the eyes in that respect! I absolutely love this blazer, elbow patches make me swoon. Especially with these shorts, such a great combination! Oh, I know what you mean! When you see or hear the kids do/say something that reflects what you do or say... And you don't like it. That's when it seems to hit home that you need to change something! I think that's a great resolution. I've recently been trying to be a calmer momma in the mornings too. That's when things get crazy as you're trying to corral the kids to head out the door and it's SO easy to lose your cool. So, I've been taking big deep breaths and making a point to keep my temper under control. Glad to hear the wine was good, might pick me up a bottle. As always you look great, I really like the clutch. Such a cute look, I love the chic classiness of this!! Beautiful!! I adore the entire outfit. Just perfect and glamorous, very you. Good that you are prioritizing sleep, me too I realized I wasted too much time and I paid the consequences the day after. great blazer and yes, so true. we're the true role models to kids at home. i am no longer blogging way past bedtime cause sleep is very much needed lately. Super classy :) Thanks for your sweet comment!! Great outfit! You look like you should be some snazzy Miami lawyer or something. Such a darling post. Kids are like little sponges and sometimes it's great while other times not so much. From what I can see (or rather read) you are a doing a great job at being mom. I really like this outfit. It's a very classy menswear inspired look. Your hair looks great like that too. love the elbow patches! my mom just added some to a blazer i thrifted. i love that purse too! Loving this outfit! 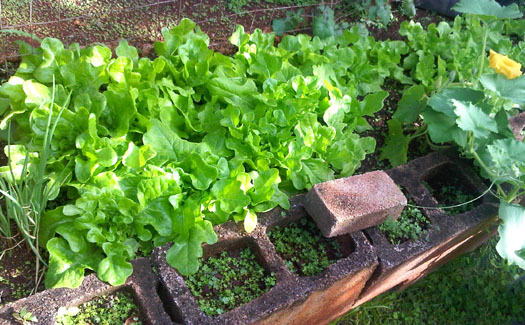 Lettuce from the garden is so nice, I'll have to wait a few months for some of that fresh goodness! Aww kids are little sponges, which I can imagine is super scary sometimes, haha. As for your outfit, I am soo in love with that blazer!!! It really ties your whole look together. I love it! !